Ruben Villa impressively passed a test Friday night. 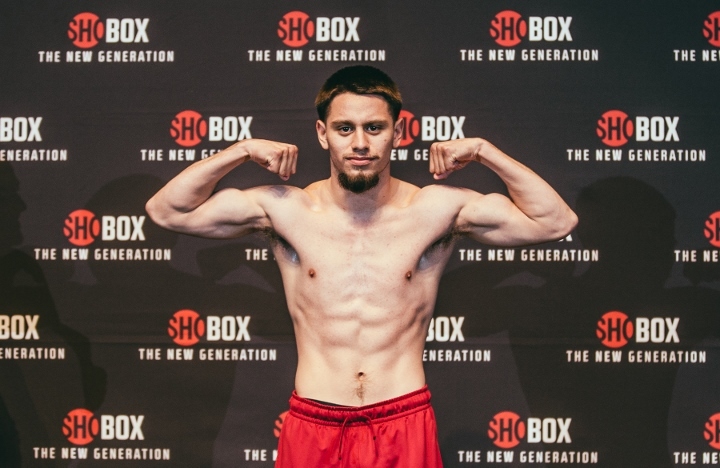 The left-handed featherweight prospect picked apart heavy-handed but limited Colombian Ruben Cervera throughout their eight-rouner at StageWorks in Shreveport, Louisiana. All three judges – Pat Dayton, Mickey Lofton and Bruce McDaniel – scored every round for the sharper, skillful Villa (80-72 apiece). Showtime televised Villa’s victory as the second of three bouts that composed a “ShoBox: The New Generation” tripleheader. The 21-year-old Villa, of Salinas, California, improved to 14-0. Cervera, also 21, lost for the first time as a pro (10-1, 9 KOs, 1 NC). Cervera’s record was built almost exclusively against fighters with losing records in his home country. Like many Colombian boxers, though, he possessed power, pressed forward and tried his best to land a fight-changing shot against a left-handed opponent who was a much better boxer. Cervera continued that pursuit throughout the seventh and eighth rounds, but Villa remained in control. Villa continued to land at will against Cervera, who couldn’t do anything other than move forward and try to land hard right hands. Cervera landed a low blow that caused referee Laurence Cole to give Villa time to record with 1:56 to go in the seventh round. That was about as close as Cervera came to slowing down Villa. Villa spent much of the fourth, fifth and sixth rounds picking apart the limited Cervera with his jab. He threw plenty of combinations during those rounds as well, whereas Cervera mostly just swung one wild, inaccurate punch at a time. Villa punched in combination during the third round and kept out of Cervera’s punching range for much of those three minutes. Cervera did land two right hands just after the one-minute mark of the third round, but Villa regained control of it thereafter. Villa’s jab landed consistently during the second round and helped him keep Cervera from punching at times. Cervera landed a right hand with just under 50 seconds to go in the first round. Villa took that shot well, though, and shook his head to let Cervera know he wasn’t hurt.